Hurricane season peaks in September, and wildfires are still burning throughout the Pacific Northwest and from California to Colorado. OSHA urges employers to be prepared to keep their workers safe during extreme weather events. The agency’s Emergency Preparedness and Response webpage provides information on protecting workers before and after hurricanes, wildfires, tornadoes, floods, and other natural disasters strike. A meeting will be held Oct. 16 in Washington, D.C., to solicit public comments and suggestions from stakeholders on whistleblower issues in the finance industry within OSHA’s jurisdiction. OSHA is seeking input on improving whistleblower customer service, and enhancing understanding of the whistleblower laws it enforces. The meeting will be held at the Department of Labor’s national headquarters. Those interested must register by Sept. 30. More information will be available in the news section on the Whistleblower Protection Programs webpage. Virginia Occupational Safety and Health issued five citations and $304,130 in penalties to Lanford Brothers Company for exposing workers to respirable crystalline silica hazards while using jackhammers to remove concrete from bridge piers. Inspectors determined that the company did not provide adequate eye and respiratory protection, failed to assess each worker for exposure to respirable crystalline silica, and permitted workers to use jackhammers and concrete saws without proper control methods. ArtiFlex Manufacturing was cited for exposing workers to amputation hazards after an employee’s finger was partially amputated. Inspectors determined that the company failed to guard pinch points on a conveyor belt, a violation the company was also cited for in 2016. ArtiFlex faces penalties of $213,411, and has been placed in OSHA’s Severe Violator Enforcement Program. Read the news release for more information. OSHA cited Hammers Construction, Inc., and Montes Construction, LLC, after a worker fell while installing metal roofing panels. Inspectors determined the companies failed to use adequate fall protection and restrict workers from standing on the mid-rails of scissor lifts. Montes Construction was previously cited for failing to provide fall protection, and now faces a willful citation. OSHA proposed penalties totaling $177,893. Read the news release for more information. Hawaii Occupational Safety and Health issued four citations and $47,080 in penalties to ABM Industry Groups, LLC, for exposing working to falls and hazardous energy. Inspectors concluded that the company failed to provide guard railing on an elevated open-sided platform, train workers on the control of hazardous energy, and conduct periodic inspections of hazardous energy control procedures. N95 respirators are the most widely used respiratory protection in the workplace. Because they are so commonly used to eliminate exposure to hazardous airborne particles, the National Institute for Occupational Safety and Health designated Sept. 5 as N95 Day to share resources that promote proper use of NIOSH-certified respirators. Visit the N95 Day webpage for more information. The Arkansas Amputation Prevention Stand-Down, Sept. 5-Oct. 5, invites employers and workers to pause during their workday and focus on best practices to avoid amputation hazards. A kick-off event in Fayetteville, which can be viewed online, will include testimonials from workers who have suffered amputations. A website is available for employers and workers to register for the stand-down, access posters and other resources, record their data, and print a certificate of participation. Through its alliance with OSHA, the American Staffing Association will host a free webinar on Sep. 12 at 3 p.m. ET on protecting temporary workers from workplace noise exposure. This webinar will review OSHA’s new temporary worker bulletin on Noise Exposure and Hearing Conservation, summarize the elements of a hearing conservation program, and outline staffing firm and host employer responsibilities. For more information and to register, visit the webinar website. Voestalpine RFC contacted OSHA’s On-Site Consultation Program to help improve its safety and health program at its metal roll-forming facility in Ferrell, Pa. As a result, the company’s rate of recordable injuries dropped to 30 percent below the national industry average, with no injuries resulting in lost work days. The company was accepted into OSHA’s Safety and Health Achievement Recognition Program, reduced workers’ compensation costs by five percent, and improved worker morale, hiring, and retention. For more information, see the success story. Harvey Cleary Builders established a strategic partnership to promote workplace safety and educate workers on hazards during construction of an office building and underground garage in Washington, D.C.
Gilbane Building Company and the Milwaukee Building & Construction Trades Council signed a one-year partnership to address common construction hazards such as falls, electrical, silica, noise, and carbon monoxide exposure during the construction of a hotel in Milwaukee, Wis.
Miron Construction Co., Inc., entered a one-year partnership to prevent common causes of workplace injuries and illnesses during construction of a university residence hall in Eau Claire, Wis. Hazards to be addressed include falls, electrical, struck-by, caught-in/between, silica, asbestos, lead, carbon monoxide, heat stress, cranes, and noise. Choate Construction Co., and Associated General Contractors of Georgia, Inc., have joined a strategic partnership to provide weekly training on falls, noise, rigging, heat, and silica, as well as the proper use of respirators and personal protection, during the construction of a senior living development project in Woodstock, Ga. The OSHA Alliance Program fosters collaboration with groups committed to worker safety and health. 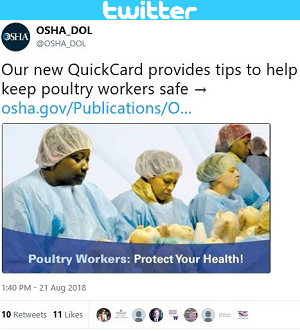 Alliance partners help OSHA reach targeted audiences, such as employers and workers in high-hazard industries, and give them better access to workplace safety and health tools and information. Associated Builders and Contractors of Connecticut renewed a five-year agreement to address safety and health hazards in construction. Fehr’s Metal Building and Construction renewed a three-year agreement to train construction workers about industry-related hazards, including falls, electrocution, struck-by, caught-in or between, and heat illness. New Hampshire Motor Transportation Association signed a two-year agreement to reduce and prevent worker exposure to falls, struck-by, caught-in or between, and electrical hazards. Employbridge signed a two-year agreement to protect temporary workers by reducing and preventing exposure to hazards, including falls, electrical exposures, amputations, confined spaces, forklift use, and chemical exposures. OSHA recently revised the Legionellosis Safety and Health Topics page to provide the latest information on preventing, identifying, and controlling Legionella bacteria hazards in workplaces. The new page updates Chapter 7 of the OSHA Technical Manual, as well as OSHA’s Legionella eTool. Employers, healthcare providers, and health and safety professionals can use the new resource to protect workers and collaborate during worksite investigations of Legionellosis (Legionnaire’s Disease and the milder Pontiac Fever). Approximately 6,000 cases are reported each year in the United States. With more than 2,000 events held across the U.S. and abroad, Safe + Sound Week 2018 helped organizations of all sizes and industries show their commitment to safety. 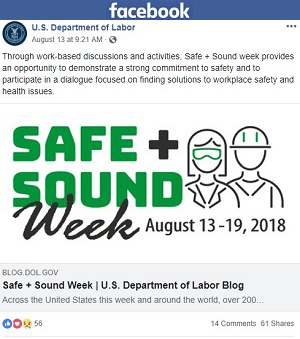 Even though the week is over, Safe + Sound Campaign’s resources are available throughout the year to help improve your workplace safety and health programs. The American Industrial Hygiene Association is also offering an on-demand webinar, free of charge during September that explains how to improve workplace incident investigations and injury prevention strategies. On Aug. 14, the Consumer Product Safety Commission issued a recall for Koehler-Bright Star flashlights because there is a risk that it can ignite hazardous atmospheres when used in confined spaces. The Koehler-Bright Star WorkSafe Model 2224 LED 3-D cell flashlight, marketed as safe for hazardous environments, was sold by Koehler-Bright distributors, Grainger retail stores, and on Amazon. For more information, see the recall notice. QuickTakes is emailed free twice monthly to more than 220,000 subscribers. You can receive it faster and easier by subscribing to the RSS feed that delivers almost instant information. Visit OSHA's RSS Feeds webpage to subscribe.